High Resolution (640 x420) Video - Motion Activated! Hidden lens views from back of calculator! Completely Self Contained With It's Own Digital Video Recorder! No more messy wires and extra power cords, LCD monitor quickly slides out of DVR at the touch of a button! Introducing our newest state-of-the-art 4 channel Inet DVR with 7" built in TFT LCD monitor. 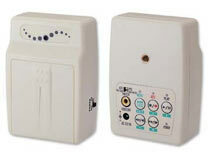 Features include 30fps MJPEG Compression, 1 audio channel, and IR remote control. All the PROFESSIONAL time lapse recorder features in a durable yet economical Mobile 12 Volt DC EEPCORE commercial grade unit. 45 hours real time HIGH DENSITY recording with audio using included T-180 VHS cassette. The very small and portable WJ180 time generator superimposes time/date on video sources as they are recorded on your VCR. Simply plug your camera into the unit and the WJ180 into the video in of your VCR. Even allows for up to 20 character camera ID. 9V powered also allows for use on body worn applications using 9V battery. Internal back up maintains correct time/date setting for days if power is lost. Our stand alone Digital Video Recorder features Internet viewing and 4-channel operation. This digital video recorder gives the user the ability to record and watch from any computer around the world without using a computer based DVR. Built in CD-RW and 120 GB hard drive. Our stand alone Digital Video Recorder features Internet viewing and 16-channel operation. This digital video recorder gives the user the ability to record and watch from any computer around the world without using a computer based DVR. Built in CD-RW and 120 GB hard drive. Up To 80 Hours Of Recording With SD Card! 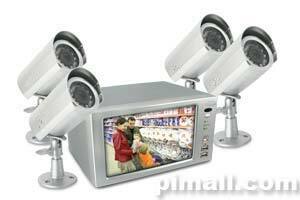 Our new Home Security Video Recorder is the most economical was to capture video for personal or business use. With 16MB of built in memory and you can also add memory in the external SD slot. (SD card not included) Built in AV in/out is perfect for the DIY. The ViB (pronounced "vibe") is one of our newest developments! It features a built-in 6dB receiver and external video port for video input, a 5" LCD Monitor for immediate viewing, a 24-hour real time/960-hour time-lapse recorder, internal battery, and alarm inputs NO/NC. The FWV-System1 is truly a "turn-key" video surveillance system. This entire system is designed with simplicity in mind and requires no special training to operate. Incorporating a miniature high resolution 420 TVL black & white camera, the supplied Hi8 digital video recorder captures the action from beginning to end using state-of-the-art video technology. With a time and date stamp and universal body wire receiver, the captured video truly memorializes the scene. Our easy to use 1280-Hour Time Lapse Recorder offers reliability in an affordable price range. This recorder has the capability to record 40 hours of real time video and up to 1280 hours of time lapse video. Great mobile DVR with four channels you will love using! This DVR ushers in a new generation of networking DVRs with DHCP and email support. 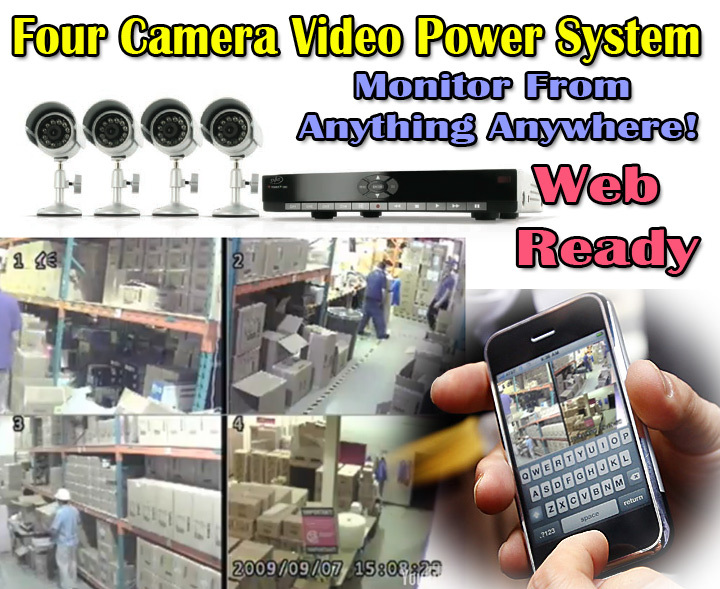 Remote viewing has also been made easier by it's built in video server. It has the ability to record at 30 fps per channel (120 total) and uses MPEG2 compression which can make a hard drive last up to 3 times as long as conventional compression methods. Backing up data has also been made easier with its built in CD burner and USB ports for still frame backup. For those in a video recording budget, we are happy to offer this time lapes video recorder that has the advanced features you usually only find on more expensive recorders! Will Fit Inside A Pack Of Cigarettes With Room To Spare! Option Modes Include, Conventional Recording, Scheduled Recording, Motion Activation Recording And Time/Date Stamp Overlay Recording! The New PocketTek-DVR mini digital video recorder (DVR) offers features found only on high end security digital video/audio recorders. User options include manual record, scheduled recording, motion activation recording and time/date stamp overlay recording. All packed in a device about the size of a standard deck of playing cards! Video and audio are recorded and stored on tiny SD (secure digital) card. Up to 5 full hours recording on a single 1Gb SD card. Recordings can be viewed by connection the PocketTek-DVR to any TV/monitor or through windows media player by simply removing the SD card and inserting into your computers card reader. Supports SD cards 256Mb and above.